1. Up to 90% off top brands on Shopee Mall, including Oppo, Quaker, Head & Shoulders, and Robinsons Appliances. 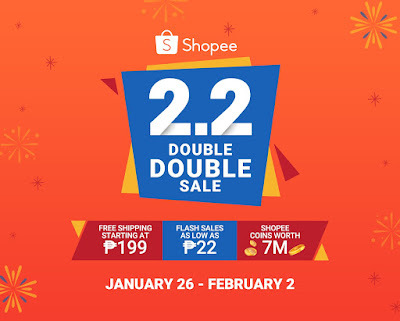 Shoppers can also enjoy greater savings with free shipping starting from ₱199, flash sales as low as ₱22, and ₱7 million worth of Shopee coins up for grabs. 2. Back-to-back themed days every 24 hours starting January 26. Users can watch out for 2.2 Flash Sale Day on January 26 with 9 rounds of flash sales; and 2.2 Vouchers Sale on January 30 offering countless vouchers from a wide range of categories and brands. 3. 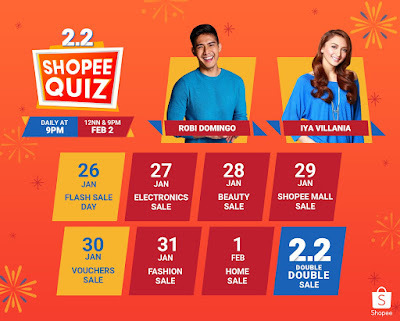 Daily sessions of Shopee Quiz at 9PM, with an additional session on February 2 at 12NN promising an upsized pool of Shopee coins.